American Special Stratocaster HSS [2010-current], STC-Shaped Guitar from Fender in the American Special Stratocaster series. The three instruments in the new series—the American Special Telecaster, American Special Stratocaster and American Special Stratocaster HSS—are described as affordable U.S.-made Fender electric guitars. All three American Special guitars feature alder bodies with gloss urethane finishes, 9.5”-radius maple necks with jumbo frets, and Fender’s best-selling Texas Special pickups (the Stratocaster HSS also has an Atomic humbucking bridge pickup). The American Special Telecaster has a vintage-style string-through-body Telecaster bridge with three brass saddles, a black pickguard, and is available in Olympic White and Three-color Sunburst. The American Special Stratocaster has a vintage-style synchronized tremolo and white pickguard, and is available in Candy Apple Red and Two-color Sunburst. 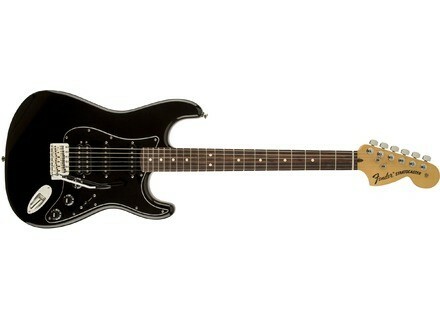 The American Special Stratocaster HSS has a rosewood fingerboard, black pickguard and vintage-style synchronized tremolo, and is available in Black and Three-color Sunburst. [NAMM] Fender G-DEC 3 Fifteen Fender introduces the next models of its G-DEC (Guitar Digital Entertainment Center) amp series, the G-DEC 3. [NAMM] Jackson JS Series In celebration of its 30th Anniversary, Jackson welcomes the new JS Series models to the dark domain of the Bloodline in 2010.